With only two specimens known to exist, the Yunnan Spring Dollar is considered among the very rarest of Chinese coins. One coin sold for $1,035,000 at a Hong Kong auction in August 2010. The only other known specimen is scheduled to be auctioned in September 2011. As you might expect, there is a great deal of excitement and publicity concerning this upcoming auction since it is not likely that either of these coins will be available again to collectors or museums for many years or perhaps even generations to come. Besides their rarity, one of the main attractions of these coins has to do with the reference “spring” dollar. These are the only coins in Chinese history to include a season in the inscription and it has been considered a mystery as to why this was done. At the left is the Yunnan Spring 1910 Silver Dragon Dollar which was auctioned last year. I personally consider this coin to be the more visually appealing of the two even though its “official” grade (“AU55 NGC”) is slightly below that of the coin (“AU58 NGC”) to be auctioned next month. The four large Chinese characters at the center of the coin read xuan tong yuan bao (宣统元宝) which means it was minted during the reign of the Xuantong Emperor (1908-1912) also known as “The Last Emperor”. The denomination of the coin is written at the very bottom as ku ping qi qian er fen (库平七钱二分) which is “Treasury Standard 7 Mace and 2 Candareens”. In English, the coin is usually called a “dollar”. Unfortunately, this is not quite correct. According to several Chinese websites including the “Baidu Library” (百度文库), which is the online encyclopedia maintained by China’s major search engine “Baidu” (百度), the reason that “spring” was included in the inscription is as follows. The coin is intimately connected with the monetary reforms which were taking place in China at the time. 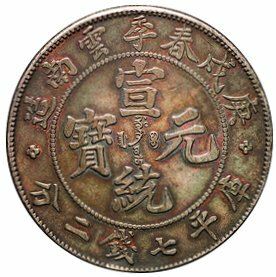 On April 15, 1910, the Qing Dynasty government promulgated “Currency Regulations” (币制则例) in order to standardize the minting of the silver coinage of the country. The authority to mint silver coins was taken away from all provinces and consolidated at the mint in Tianjin. However, since China covers such a vast area, it was not considered practical to have all silver coins made at one mint and therefore branch mints were established at Hankou, Guangzhou, Chengdu and Yunnan. The new regulations required the silver dollar coins to be of a uniform design, purity, weight and size. Since this was not the case with the coins that were being minted at the four branch mints, these mints were ordered to cease production and await further instructions from the Tianjin mint. The branch mints were also to wait until they received the new standardized dies before resuming production. However, a few of the branch mints, for selfish reasons, refused to cease the minting of silver coins. 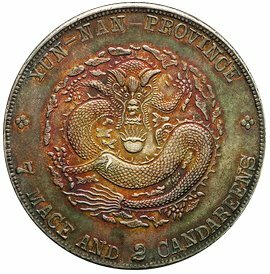 The Yunnan branch took dies that had been used to make the 1909 coins and engraved at the top the additional inscription “made in the Spring of 1910”. According to the traditional Chinese calendar in use at the time, “spring” referred to the first three months of the year, namely, January, February and March. In this way, the Yunnan mint attempted to circumvent the new regulations by saying that the coins were made before April of that year. The Chinese central government discovered the scheme at the Yunnan mint and ordered that all these new coins be withdrawn and melted down. However, a very very few of the coins escaped being destroyed and these are the specimens that are now known as the Yunnan Spring Dollars. Thus, the “mystery” surrounding the appearance of the word “spring” on these coins is a mystery no more. I have a silver coin identical to this except instead on the back around the top it has 6 characters instead of 7 do you know if this has any value it is 999 silver. Thank you very much can’t wait to hear from you. I sent you an email requesting additional information to help identify the coin. I have coin that looks like that one. How do i find out information on it. I will email you for additional information. i think i have one coin. i already checked, the coin i have is 1906 szechuan 10 cash. I have an identical one from the picture above. Could mind be “real” because it looks very real after 100x of carefully looked. Please tell me. I will email you requesting additional information. I have a coin like this I got when I was in Taiwan in 1992. Mine has two dragons on front. It has 6 characters on top and 4 on the bottom. I have a coin tray that is similar to the one above. It is marked Yun-Nan Province 3Mace and 6 Candareens. Around the coin is fine filigree work in silver in the shape of a dish and approx. 4 inches in diameter. Looking for information. I have a silver coin identical to this except instead on the back around the top it has 4 characters instead of 7 do you know if this has any value it is 999 silver. Thank you very much can’t wait to hear from you. You probably have this version of the coin which was made in 1909. An authentic coin weighs about 26.56 grams, has a diameter of 38 mm, and a fineness of 88%. It should not be attracted to a magnet. This version of the coin is not rare. Unfortunately, I do not know coin prices so I cannot tell you its current value. with my online research,I found Numista Rarity index: 92 rated for this coin. can I get any amount if i want to sale this further. The “Numista Rarity index: 92” refers to the very rare “1910” version of the coin which I write about in my article. Your coin is the common “ND (1909-1911)” version. The “ND” refers to “No Date”. Please be aware that there are many fakes of this coin. I have a coin that looks like the example shown of the yun nan province 7 mace and 2 candareens coin. It seems to be in too good a shape to be so old, was this coin ever remade? The coin was never officially remade. However, fake copies of this very famous coin are extremely common and can be bought for a dollar or two. I have a coin similar to the one on the picture, after researching on line I believe it is a fake based on the characters on the back of the coin. But before I give up on it. Could I send you a picture of it, it was my father’s he has passed away and as I was cleaning up some of his things I came across this coin. Thank you for your time. If you email me clear images of the coin I will try to help you. I came across 7 coins, 7 mace 2 canareens, that belonged to my mother. They are in a collector’s case (plastic, each one stored separately). 3 are from Hu-Peh Province and the other 4 are from Yun-Nan Province. They are in very good shape and as my step-father collected rare coins I believe they are genuine. I’ll email you requesting clear images of the coins. how can I find out more information, it looks like I have 1 coin like this .. I have a coin identical to the one pictured, but more worn. How do I go about verifying its authenticity? found a coin like the picture above requesting information about the coin . Kiang. Can you shed some light on these coins? Any help will be appreciated. Thank you in advance. I will email you requesting images. Hey, I’ve received a coin similar to the coin that’s is described but it has four characters on it and it’s gold. Can you please tell me whether this is a fake or real? I will email you requesting images of your coin. I also have a coin as others. Would like to know if it is worth something. kiang nan province 7 mace and 2 candareens . I just now sent you an email. Please check to see if your coins are attracted to a magnet. Also, please provide the weights of your coins in grams. I have some old silver Chinese coins measuring about 45mm in diameter and with only Chinese writing – no dates. May I send images to you? Yes, please send the images and I will try to help you if I can. I have a coin which has all written in Chinese and I want to know the value of it in inr. Can I know plzzzzzzzzzzzzzzzzzzzzzzzzzzzzzzzzzzzzzzzzzzzzzzzzzzzzzzzzzzzz. I’m sorry but I do not know coin prices. Can you tell me how can I have it appraised…….or …..where can I go to see the authenticity of this COIN. I’m sorry but I am not familiar with any Chinese coin dealers in Ohio. I have 2 coin, may i send the picture to ur email directly so u can check it? Yes, please email me the pictures. Hi Gary, I have one as well. Can I get your advice as well? I have yunnan coin with twin dragons. Can I know any information about it? I will email you for further information.